When the Wall Just Has to Go! We often get the call that the kitchen needs an update. It’s the most used room in the home after all. Sometimes when update just won’t be enough, our design team will come up with a layout that is a bit more invasive. 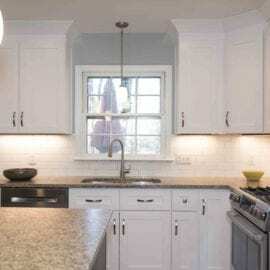 For this kitchen – it was a perfect opportunity for a wall demo project. The homeowner’s used the space for entertaining their church bible study night. What they found was people would often congregate where the food was Imagine that! Only, like the typical ranch style 1980’s home. It was a bit closed off from the rest of the home. We created a space that combined both the family living room and the kitchen. This really opened the possibilities for the new kitchen layout. Our new design now included an island, with additional seating for guests. We used stock cabinets with a granite counter this helped to update the look, while still being cost effective. As with all projects a challenge came up. The new design layout was perfect. Except now we had to deal with the flooring. When we have a demo wall project, there isn’t any flooring under it. We laced in new hardwood floors, sanded, stained and finished it to match the adjoining dining room. The new open concept kitchen now looks like it was always there. Looking to update your lighting, with a cost effective approach? Check out Kichler for more light fixture inspiration and ideas.